At Grapevine we provide the resources and solutions to simplify your information management. We aim to assist you with the growth and maintenance of your business. If your business has specific challenges that the marketplace has yet to meet, we will be happy to offer you an efficient and cost effective solution. 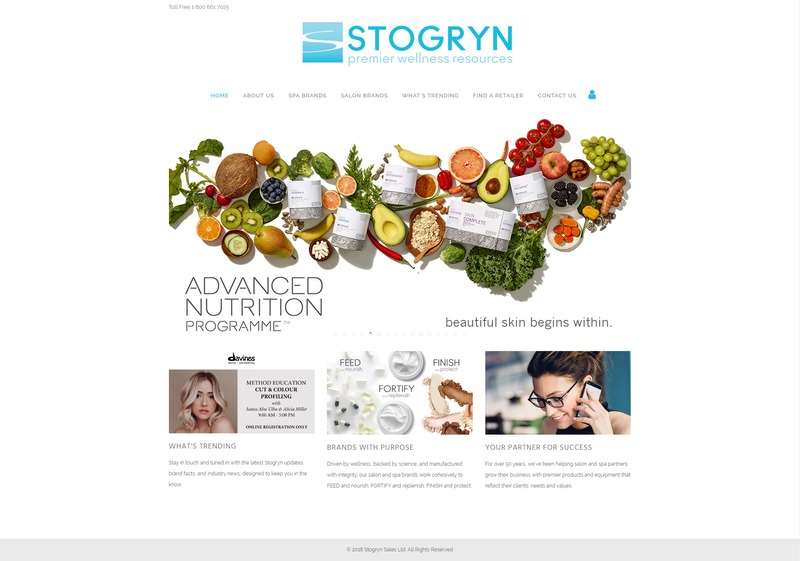 Stogryn is a wholesale distributor with over 50 years of experience supplying premier skin and hair care products to spa and salon specialists across Canada. Their brands are available exclusively through their professional partners. They wanted to showcase the brands they carry, allow potential buyers to find a retailer via a store locator, have a private members only area for their staff and retailers to access directly from their website. We worked closely with their marketing director to make sure that we kept everything on brand and easy to navigate. Because of the technology we used to built their site, they’re able to keep it up to date on their own only asking us to do major updates for them. We work closely with you to understand your needs. How can we help you?